an indeterminate or undefined place or state. disputed ground between the front lines or trenches of two opposing armies. the place in space/time where an entrepreneur is stuck (quite unproductively) in search for the elusive trophy startup to found. I was living without mobile internet for the past 2 months. Somehow Airtel had bonked my data plan, and they couldn’t set it right the first time I got on support. I figured something must be wrong with my hardware and was too lazy to follow up again. The only internet I had was wifi, when I was indoors. Unless you’ve been living under a rock, you have probably heard of Arnab Goswami and his antics. Basically if you like to watch people shouting at each other, and see one self-aggrandising man trying to pass himself off as a force for righteousness, then this is the show you need to watch. Arnab Goswami has spawned many memes, and he is famously known as the man who knows what India wants to know. Anyway, a brilliant app idea struck me while watching. Would be really glad if someone builds it. I think it might be pretty useful <I’m being serious>. So here goes.. The red indicates time spent shouting or multiple people talking in illegible debate etc. We could also measure decibel levels. I’ve noticed how they keep controlling the volume on the newshour depending on whose voice they want the loudest. Of course this could be done for other news programs as well. But since the idea came from watching newshour, I want to call it the Arnab Goswami debate talk time distribution tracker. If Arnab funds it, hell I’ll build it myself. What do you think? Does India want to know debate metrics? What are the other metrics we could track, apart from talk time? The aptness would have been better if it was the calm before the storm. Lone star. Unusually clear night for Gurgaon. Assume that Fliptrazon was the golf ball in the above gif. This is exactly what happened when I took a swing at it. So, it seems that Fliptrazon has been forever ordained to the mildly fun and pointless category. No real startup coming out of it. The good news is I didn’t waste too much time and money on it. I was able to make an MVP, test my hypothesis, try it out on a few known and a few unknown customers and get a reasonable idea of whether or not to make this a full time business (The business part of Fliptrazon was a b2b product). If anyone is interested, I could write a separate post on what I was trying to do with the b2b product and why I thought it did not work out etc. Anyway, I plan to keep it up and running, now that we’ve built it. It does not cost much to keep it up. And a number of users have started using it fairly regularly as the coupon search engine part of Fliptrazon has some strong user retention. We also made an app which we’ll put up on the play store shortly, which will make it a lot more easier to try out coupons if you’re on Android. On that note, I’ll go back to trying to figure out what to do next! Cheers. I fondly remember being a cocky 24 year old, so don’t be offended if you are one right now. You’ll grow up too! Going into something unknown, one of my instincts is to think about what all can go wrong. I may take it to extremes in some cases too (like what if.. death!). This is often taken as me being a pessimist. A friend of mine hinted at the same conclusion just yesterday and I mumbled something about me being an unlikely pessimist, after all I like to pursue lofty goals, try things that may be unlikely to succeed etc. I thought I’ll put down a better articulation of why I (and others who do the same) think like that. It is easy to brand it as “negative thinking”, but hear me out.. This had been bothering me for a while. Hope this helps if you’ve been scratching your head over it too. This always gets me thinking. And sometimes worried. Life is short. Am I making the best use of my time here? 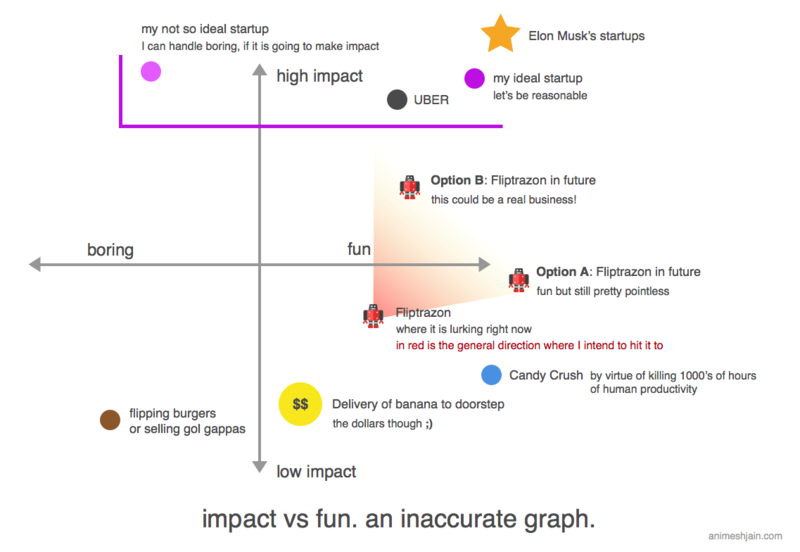 So let me try and make a case for doing something that may not look impactful (tl;dr – for fun).